After watching and discussing several hitters who used the 2019 Axe Avenge One we write this review. In general, they liked the handle and the stiffer single piece feel. The bat felt light and a good sized barrel. We’d recommend the bat for those in the single piece USA space looking for a good entry level performance bat and want to try something a bit different. We aren’t the only ones to have information about the Avenge One. Other places, in particular those who sell bats, usually have a boiler plate write up on the specs of a bat. Many of those we reference to make sure we are seeing what we should be. Here are some more references for the 2019 Axe Avenge One review. If you are at a point where you hesitate over the asymmetric knob, then stop. Articles like these might help. Or these or these. The handle is far from a novelty gimmick as many of Axe’s detractors tried to paint years ago. The handle is used at several levels of the sport including the MLB. It is safe to say the only reason other companies don’t offer such a feature is because they legally can’t do it. Axe owns the pattent on an oblong shaped handle. Recommending the Axe Avenge One is easy enough. Players that prefer a single piece bat with its accompanying stiffness and power should like it. In the USA space there are currently no other drop 10 single piece options. 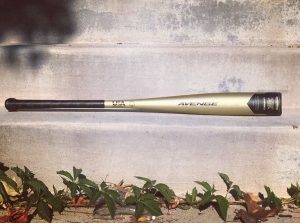 (If you want this bat in a BBCOR or USSSA then check the 2019 Axe Avenge—which is different enough). This bat is for: USA Players; Drop 10 Players; Single Piece Lovers; Composite Lovers. In terms of a drop 10 USA Bat with a single piece composite structure the Axe Avenge One stands alone. That is, no other bat is quite like it. It’s most consistent competitor, in terms of swing weight, is the 718 USA Select from Slugger. The Avenge One in the 31/21, like the 718 31/21, has a 6200 MOI. This is 7% heavier than a bat like the CF Zen in a USA. If you want to stay single piece composite then Dirty South Made (in a drop 11 or 12) and the Rawlings Threat drop 12 is your match. However, a drop 12 and 11 stand a reasonable amount different then a drop 10. The Rawlings Threat, for example, swings over 20% lighter than the Avenge One (from 6200 to 4800). Do note, there is no “right” MOI. (Mass Moment of Inertia, aka Swing Weight). These are only preferences and a useful way to compare one bat to another. We’ve discussed the asymmetric knob at length on this site. In short, the knob’s intent allows for more conformity to the shape of your gripped hand (which is an oval, not a circle). As such, better grip improves your ability to control your bat and swing it faster. In some sense, this is why at least a few major leaguers put a thing on their thumb. The validity of the idea is proven as a number of big league player use the Axe licensed wood handle on their pro wood MLB bat. This bat is new for 2019 so there is no comparison to last year’s model to make. The barrel is big and the swing weight is reasonable. You won’t get the same smooth smash on mishits you’ll find on more expensive two piece bats. But, in the single piece space, you’ll have a hard time finding a bat you like any better. For 2019, expect this bat in a drop 10 only. If it goes well, we’d love to see this bat in a drop 8 or maybe even a drop 5 for the 2020 season. To find the Axe Avenge in a NON-USA Bat version then check out the 2019 Axe Avenge.